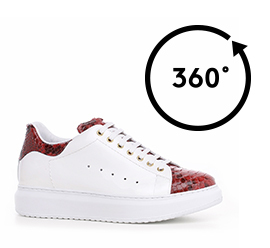 Exclusive and luxury handcrafted elevator sneaker with upper in white patent leather featuring details in python leather skin with natural and iridescent reflections ranging from bright red to burgundy and black. A stylish shoe for all seasons ideal to match with jeans or slim-fit trousers. The inner elevator system will immediately increase height by 2.6 inches (6.5 cm).